Tag Archives: John E. Bird Jr. This entry was posted in Church of St. Luke & The Epiphany and tagged Center City, Frederick R. Isacksen, Gayborhood, John E. Bird Jr., St. Luke's Tower Corporation, Washington Square West on July 20, 2015 by mjk38. 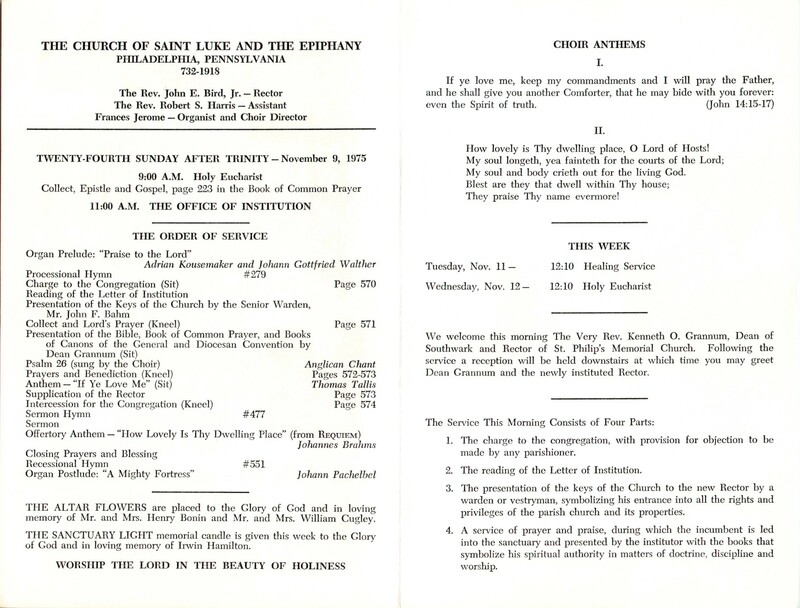 This entry was posted in Trinity Memorial Church and tagged A. Edward Chinn, Committee of Advice to the Diocesan Committee on Homosexuality, Committee on Homosexuality of the Diocese of Pennsylvania, Edward G. Harris, J. Gardner Holder, James A. Trimble, James R. Squire, John E. Bird Jr., John E. Lenhardt, John E. Midwood Jr., John M. Scott, John R. Norman Jr., Lloyd H. Winter, P. Linwood Urban Jr., Paul M. Washington, Stanley E. Johnson, Thomas W. Platt, Timothy Pickering, William E. Arnold, William E. Blewet, William J. Fischler on July 1, 2015 by mjk38.